In honor of all the true, righteous Tzaddikim, may their merits protect us. 2th Tamuz, the rosh yeshiva in a visit at rabbi akiva tomb, singing, lecture, and a pray at the tomb, 2010. Neve tzadikim: Tzadikim video gallery includes an rare video of the baba sali. Torah Lectures: Audio and video torah lectures by the Rosh Yeshiva. Pictures: Various photos including those of the Rosh Yeshiva, pictures of Tzaddikim, graves of Tzaddikim in Israel and abroad, and of holy sites in the land of Israel. You’ll be able to join our one-of-a-kind daily, independent learning program from the acclaimedbook "Chok Natan V'Lo Ya'avor", a compilation of all Rebbe Nachman’s works divided into daily lessons designed to be covered over the course of a year. Click here to begin learning!!! History of the Yeshiva. Read up on the history of the Yeshiva from when it began up until its current functions. The history of Breslov Chassidism, The life of Rebbe Nachman from Breslov and his students. Read the powerful statements made by famous Tzaddikim about Rebbe Nachman put up in honor of the Rebbe Nachman. and also in honor of Reb Nosson. wonderfuly organized by the chasiddim generations. To Enter anshei hatzadik book page... Click here!!! To Enter the Magdil yeshuot page Click here! “V’Chok Natan L’amo” – Likutey Halachot Divided for Learning Daily!! The book “V’Chok Natan L’amo”, in this beautifully bound edition, enables a person to complete the holy learning of Likutey Halachot in either one year or two years, depending on the person. It is divided per one or two year cycles. This is a special, exclusive edition and there is none like it. Click here for “Chok Natan L’amo”!!!. A beautiful Tikun HaKlali Booklet!! The Tikun HaKlali published – A Tikun HaKlali booklet so rich and splendid that it has no competitors!! There are seven different versions/colors to choose from!! The pages themselves are in color and have pictures of many Tzaddikim throughout the generations, including: Admorim, Litvaks, leaders from Morocco, Yemen, Tunisia, Turkey, and more! Click here for the tikun!!. ''Yeshuat yisrael'' Booklet for Distribution in Israel!! The ''Yeshuat yisrael'' – A Tikun HaKlali booklet so rich and splendid that it has no competitors!! There are seven different versions/colors to choose from!! The pages themselves are in color and have pictures of many Tzaddikim throughout the generations, including: Admorim, Litvaks, leaders from Morocco, Yemen, Tunisia, Turkey, and more! also you can found some sgulot and tfilot inside ''Yeshuat yisrael''. Click here for ''Yeshuat yisrael''!!!. With G-d's help, now available on the site are three wonderful additions: The tremendously strenghtening and encouraging book "VeTzaddik B'Emunato Yichyeh" - discussing the greatness of sticking to and connecting to the Tzaddik of the generation. Also added, a complete collection from the works of Rebbe Nachman and Chazal discussing the greatness and power of charity and good deeds, and how each and every person should strenghten themselves in these departments. Lastly, we added from Shevachey HaRan Rebbe Nachman's pilgrimage to Eretz Yisrael, the holy land!!! This site was designed specifically for people who are already involved with the internet. Our opinion remains against the internet for obvious, known reasons. The opinion of the Rav, in conjunction with other stringent community leaders, is that it is forbidden to surf the web. Furthermore, please do not access our website during the holy Sabbath and/or on holidays in which it is restricted to do so, in accordance with your time zone. "The book and the sword came together from the sky"
"The regret is the wholeness of the disadvantages"
"People act according to his desire"
"You will be working in the Torah"
Click here for our torah lectures page: torah lessons. Lag Ba Omer (the 33rd day of the Omer) - A Day of Inspiration! In this website you will find all of the information about this Holly Day! Lag Ba Omer is the day of the Hilula of our great Tanah Rabbi Shimon Bar Yochai, in this website you will find a full video from the Hilula event in Meiron along with many important articles about this special day, From the "Todaa"Book, Shulchan Aruch and Hasidic Judaism books. 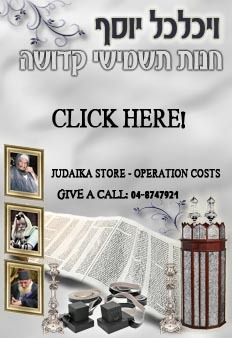 The Website has some special prayers based on Rabby Natan's book "Likutei Tfilot". An amazing thing came up! Daily 2 minutes torah lesson on the weekly parasha. Click here to enter: tzadikim videos. Click here to sign in for the Torah lectures daily updates! A special Sgula card with a beaten Arava For 10 INS Only! A special daily routine for each Chasid Breslev) - paragraphs for a jew's daily routine that were written by Rabbi Itzchak Bryter based on Rabbi Nachman's wisdom Rabbi Nachman from Breslev Self improvement- you can earn both worlds olam haze and olam haba. Click here for the daily routine ! Click here for our news page! "Tikun Klali (תיקון כללי)" Rebbe Nachman said saying these ten Psalms can rectify all sins. Saying these Psalms also has the ability to save one from all harm.